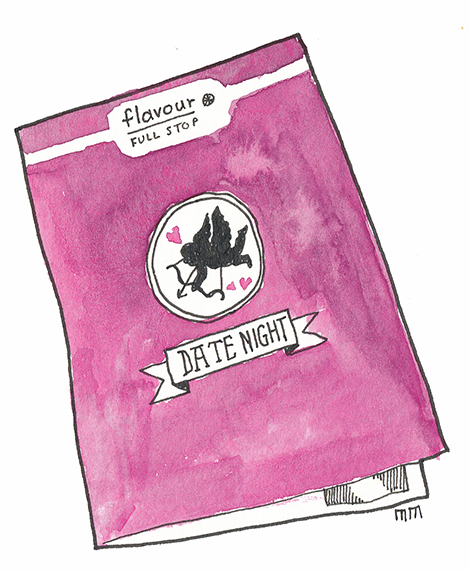 This month’s artisan food delivery from Flavour Full Stop was based around the theme of Romance. Date Night to be precise. As well as the usual guide booklet to the six treats, there was also a Date Night menu using all the ingredients at different stages of a romantic meal in. Once again thank you Flavour Full Stop for a lovely surprise package. It’s not often that we gather round a delivery box as a family and pour over each opening. Immediately reaching for the teaspoons, so we can taste test each item as we unwrap it. 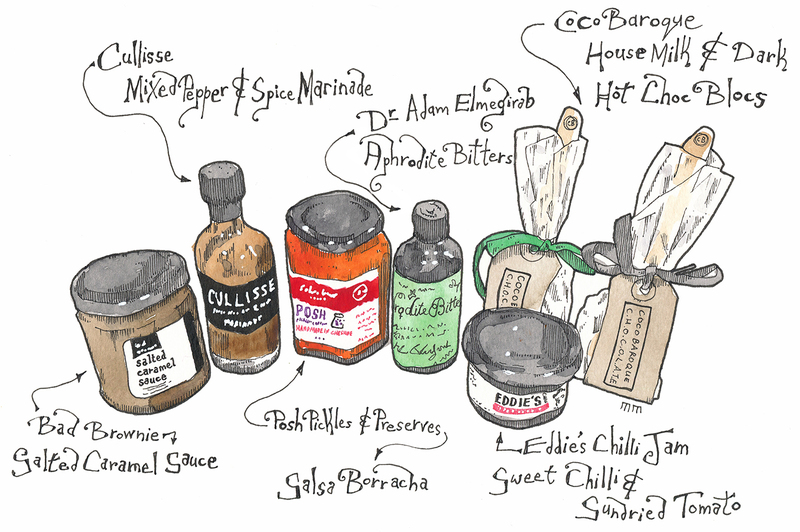 Mixed Pepper and Spice Marinade by Cullisse – I’m looking forward to trying this peppery marinade at the weekend, it certainly smells like it will give a kick to our steak. Salsa Borracha by Posh Pickles and Preserves – A thick, roasted pepper salsa. It’ll be a shame to just use this on the prawns in the suggested menu – I’ll nab a bit to go with my packed lunch. Aphrodite Bitters by Dr.Adam Elmegirab – Ah, something to add a dash of civilisation to my February evenings. Sweet Chilli and Sundried Tomato Jam by Eddie’s Chilli Jam – A lovely, thick chilli jam. House Milk and Dark Hot Choc Blocs by Coco Baroque – Caroline, Lucy and I have been arguing over who gets which one (I may have to get up early tomorrow and have myself an early morning mug of hot chocolate. For Christmas this year Caroline and I bought each other experiences and edibles. One of the gifts I got Caroline was a three-month subscription to an artisan food box, from a website called Flavour Full Stop. 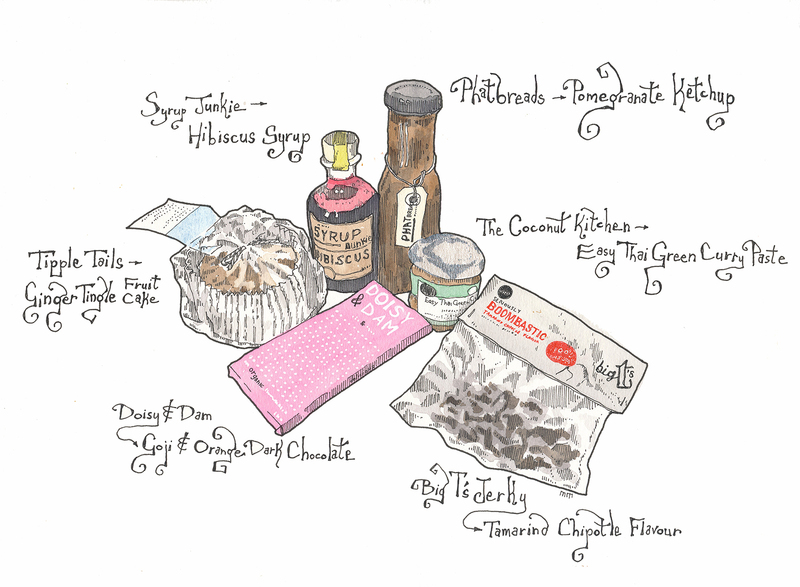 Each month they send out a selection of six artisan food products sourced in the UK and roughly built around a theme. We both like artisan products and I thought it would be a fun way to try some new and different products from those we can pick up at our local farm shops and delicatessens. 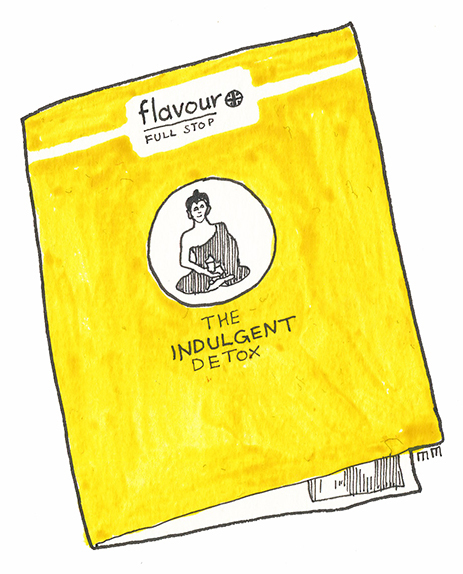 Our first package arrived yesterday and, as Caroline predicted, it was based around detoxing after New Years celebrations. Pomegranate Ketchup – by Phatbreads – This has a delightful see and sour flavour a little bit like a chutney. Hibiscus Syrup – by Syrup Junkie – Used for making cocktails; alcoholic and non-alcoholic. Ginger Tingle Fruit Cake – by Tipple Tails – This has a recommended accompaniment of blue cheese. Delicious! Easy Thai Green Curry Paste – by The Coconut Kitchen – Which also has a recipe connected with it on The Flavour Full Stop website. Goji and Orange Dark Chocolate – by Daisy and Dam – Chocolate with berries in – yummy! Tamarind Chipotle Flavour Jerky – by Big T’s Jerky – Gotta love the jerky.